Medium-sized shrub (7′-10′ tall) of wetlands, but adaptable to moist garden soils; late-flowering and very attractive with fragrant blossoms and large, shiny, deep-green foliage; interesting winter bark and persistent fruit; deserves to be planted more than it is, to benefit pollinators in late summer and for its beauty; ranges from Nova Scotia south to the W. Indies, from Ontario south along the Mississippi to Texas. “Common buttonbush” does not serve its namesake Cephalanthus occidentalis adequately; the imagery is amiss. A button, mass-produced after 1826, is a flattened disk, slightly concave, perforated with holes or shanked for threading. Handmade buttons, before the early nineteenth century, came in so many sizes, shapes, and materials that it would be difficult to assign them to a single geometry. (Not even their purpose was uniform, or utilitarian: some were pure ornamentation, called vanities by the Puritans who eschewed the decorative for practical hooks and eyes). The so-called “button” part of Cephalanthus occidentalis starts as an insignificant spheroid of pale green, barely noticeable in mid-summer among the shrub’s glossy green leaves. It is a peculiar flower head that expands as it matures into a perfect globe radiating with tubular florets. In full flower it is a fragrant, cream-colored sputnik of pollen and nectar, its styles exerted beyond the two hundred plus corolla tubes inviting a great many insects to sup. One of Cephalanthus occidentalis’s other folk names—honey-balls[i] perhaps—might raise the shrub’s stock with gardeners and landscapers. Declines in European honeybee populations since 2006, have focused attention on the importance of native pollinators. A shrub with pollen and nectar-filled flowers like “honey-balls”, especially one that produces food for bees and other pollinating insects late in the summer, is a significant contribution to the landscape. Stand or sit in your garden and look for bees while they forage. Choose a few bumble bees to follow. The moniker “bumble bee” includes a number of species in Maine in the genus Bombus. Identification at the species level depends largely upon the stripes, colors, and blotches on the bees’ pelted bodies. The “fur” on bumble bees is a dense hair coat which provides insulation, allowing these bees to rouse themselves and fly at lower temperatures, an advantage over many other winged insect pollinators. If you venture early enough into the garden on a cool late-spring or summer morning, bumble bees will be your first bee companions. Assuming that a flower garden is your observation post, do the bumble bees fly feverishly from one plant to another’s different flowers, or do they land on one plant and assiduously explore its every blossom? Bees prefer to harvest one flower species at a time, and usually, longer visits indicate the discovery of greater rewards within a flower. Quantity and quality of pollen and nectar are the bumble bee’s objectives. A quick, frenzied search and hasty exit from a bloom may mean a disappointed, still-hungry bee. The more activity and energy spent looking for pollen and nectar, the greater the hardship for the bee. In somewhat anthropomorphic terms, a bumble bee prefers to use her own calories taking food back to her brood, rather than consuming them in unavailing flight. The chemistry of a pollen grain varies from one flower species to another. Some pollen is rich in amino acids, lipids (fat, oils), vitamins, sugars, proteins, and minerals. Nectars provide sugars essential for flight. Many of the flowers that we grow in our gardens have neither pollen nor nectar. Slews of annuals, bedding and popular container plants, fall into this pollinator-unfriendly category. The wild ancestors of these colorful, tender plants may have produced nectar and pollen once but hybridization has removed the plants’ reproductive apparatus, rendering their flowers sterile. As long as they have warmth and food and water, the plants will continue to bloom profusely in a futile attempt to fulfill their procreative imperative- which accounts for their commercial success (and the superlatives worked into their trademarked names, synonymous with “perpetual”). Further hybridizing sleight-of-hand has designed plants with doubled (tripled, quadrupled . . . ) petals, presumably a flower trait for which there is an aesthetic demand and a consumer market. The extra petals crowd or replace nectaries, again cheating pollinators, and usually removing fragrance from the flowers’s repertories. Except for emergency shelter— and who hasn’t bent to sniff a flower and come nose to face with a rain-disheveled, grumpily buzzing bumble bee recovering from an unexpected overnight within? — most native bees do not nest in plants. Other pollinators, Lepidopteran species in particular, do use an entire plant at different stages of their life cycles. Adult moths and butterflies gather nectar from flowers, lay their eggs on stems and leaves, and foliage provides food for their larvae. Cephalanthus occidentalis hosts a number of invertebrate species who use various parts of the shrub. In The Butterflies of North America, the nineteenth-century naturalist and artist Titian Ramsay Peale (1799-1885) painted portraits of the life histories of Lepidoptera. Uniquely, he studied, described, and illustrated not only adult butterflies and moths, but their caterpillars and eggs, chrysalises, and cocoons, and the plants upon which their metamorphoses depend. Peale began his studies under fellow Philadelphian Thomas Say (1787-1834), an entomologist and conchologist, whose pursuits were both scholarly (taxonomic) and practical (agronomic). Say matched Carl Linnaeus’s (1707-1778) zeal for classification, but insisted that America develop its own scientific literature and resources. Previously, New World specimens were sent deferentially to England and Europe for examination and identification. Peale provided plates for Say’s slim (twenty-eight pages for all the known insects!) first volume of “American Entomology” in 1817, a treatise not actually published until 1824, when it was incorporated into a larger work with several other illustrators in addition to Peale. Peale’s own manuscript, finally published in 2015 by The American Museum of Natural History, looked at butterflies and moths on their host plants, painting their interdependence. His plate for the pink-spotted hawkmoth (Agrius cingulatus) captures Cephalanthus occidentalis with one pert flower head and two side buds on a branch whose lowest leaf is being fastidiously consumed by a hawkmoth caterpillar. Other Lepidoptera who visit the buttonbush for nectar are the eastern tiger swallowtail (Papilio glaucus) and the black swallowtail (Papilio polyxenes). These two species are sometimes listed as pollinators of the buttonbush along with long-tongued Bombus species. Buttonbush’s foliage feeders include the larvae of the Promethea moths (Callosamia promethea), smartweed caterpillars (the smeared dagger moths, Acronicta oblinita), beautiful wood-nymph larvae (Eudryas grata), and hydrangea sphinx moth larvae (Darapsa versicolor). Other insects drawn to buttonbush’s fragrant flowers are beetles, wasps, and flower flies. Rhabdophaga cephalanthii is a gall gnat who uses buttonbush’s stems to cache its larvae. Buttonbush is found in the wild in Maine along streams, pondshores, and rivers, and in swamps and wetlands, often in company with another August-flowering shrub rosy meadowsweet (Spiraea tomentosa). The riparian (riverside), lacustrine (lakeshore), and palustrine (marshy) preferences of buttonbush are in sunny exposures. To reach a wild colony of Cephalanthus occidentalis one departs the firm dry footing of open woodland and upland field, clambering through the damper inclinations of alder and willow to enter the shifting, hummocky intervale between land and water. To do so when buttonbush blooms and scents the air is to see and smell the shrub at its best with its feasting pollinators, and apprehend summer at its fullest from the perspective of plant and insects. Buttonbush is happy to have very “wet feet”, its roots and lower branches seasonally inundated, even submerged. Henry David Thoreau noticed a large raft of buttonbush, uprooted by flooding in the Sudbury River, that replanted itself farther downstream. Even with this tolerance for saturated sites, Cephalanthus occidentalis is easily grown in humus-y, moisture-retentive garden soil. The shrub is an appropriate candidate for planting near roof eaves which will supply regular early-morning drips of condensation. A downspout drainage area could also be channelled to supply extra hydration, but once established, the buttonbush is resilient and content with even moisture. If a garden has a spacious, acidic low spot, swale or damp meadows-ward, it would be worth repeating the natural combination of rosy meadowsweet and buttonbush. The two shrubs are structurally distinct but complementary, especially in their long, late-season flowering. Buttonbush has a conventional shrub form with strong branching. Its older trunk bark is attractively diamond patterned with lattice-like raised ridges. Its ovate leaves are markedly veined, and a deep, lustrous green. New twig growth and leaf petioles sometimes have a reddish tinge, a characteristic painted in Titian Peale’s buttonbush portrait. Flowers appear on new twig growth. Rosy meadowsweet, also known as steeplebush, is very perpendicular. It is a member of the rose family (Rosaceae) and its canes thrust like spires. The terminal inflorescence, composed of innumerable tiny florets, open centrifugally, slowly from the center stem outward, and from top to bottom. The visual effect is a bit gauzy and pinkly light-hearted against the emphatic woody canes. Rosy meadowsweet’s leaves are small and tomentose, as the specific name indicates: the leaves’s undersides are furred with hairs. Rosy meadowsweet, unlike buttonbush, has little nectar, but copious pollen. Both shrubs can bloom for more than a month. 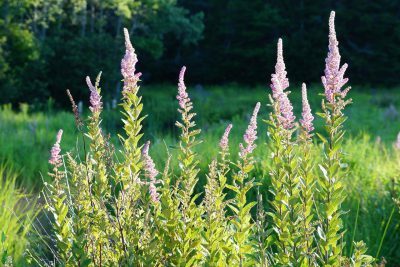 Planting multiples of these shrubs compounds the wildlife benefits. The birds associated with buttonbush are primarily wetland denizens who eat the shrub’s plentiful seeds once they are shattered onto the water surface: mallards, Virginia rails, American bitterns, Canada geese, wood ducks, blue-winged and green-winged teals, gadwalls, ring-necked ducks, American wigeons, northern pintails, black ducks, and northern shovelers. Each buttonbush fruit can produce up to four hundred seeds (called nutlets), evidence of the flower’s attraction to pollinators—this despite a seed weevil, Polcetes ulmi, that sometimes infiltrates the fruit, consuming the seeds one by one. Other birds can be found nesting in the safety of the clonal thickets of buttonbush: alder flycatchers, song sparrows, and red-winged blackbirds. Some sources indicate that Cephalanthus occidentalis is poisonous to mammals (livestock) because the shrub contains cephalothin, a glucoside. Others cite only deer-resistance, while there are still other references to foraging by deer and beavers. Buttonbush, nevertheless, has been used traditionally to treat any number of illnesses and complications among humans. Its primary application was as a febrifuge, reducing fevers by sweating. Cephalanthus occidentalis bark was distilled and used as a substitute for quinine, an alkaloid made from the South American Cinchona tree and successful in the treatment of malaria. Buttonbush is easy to grow from seed. The fruits mature in the fall inside round balls about 1/2″ in diameter. Ripe seed balls are brown and can be broken apart to reveal the small arrow like seeds. These seeds need no pretreatment (i.e. winter stratification) to germinate and can be stored dry until fall or spring sowing (or indoors in a winter greenhouse). These seeds can support a large population of weevils so check the seed carefully before storing. [i] Other common names include: button-ball shrub, river-bush, globe flower, knuckle-brush, pin-ball, pond dogwood, little snowball, crane-willow, and crouper.